This has been created to log the development of this new diploma at Otago Polytechnic. Its been a while but here I am again. Today I am showing year two students this blog and the numerous other ones I run. We have 12 students completing the second year of the diploma this year. The first course for students is Sales and Marketing followed by Sustainable Practice. Its interesting to note that none of the students in class have a blog - amazing really. This is an update of the progress we are making on the development of the Diploma in Applied Travel and Tourism. Tour Guiding – completion of new integrated assessment for pre-moderation with ATTTO. Small amount of work on local course – Natural Flora and Fauna. Reworking of lesson flow. Ready for delivery next semester. Adventure Tourism – design of assessment for pre-moderation by ATTTO. Development of teaching resources (build on from Tour Guiding already well planned). Plan for 10 day taster in Wanaka. Ready for delivery next semester. These two specialties are top priority with the return of the tour guiding specialist this week. It is expected all work will be completed by end of August. Travel Operations – After reflection on this specialty updating and refinement of teaching delivery and assessment will be carried out next semester. Research Work Based Specialty - liaising with BAM/CEP project coordinator to work a combined approach and development of teaching resources under way and assessment design and pre-moderation. Ready for delivery next semester. Ninety percent developed – needs reflection and minor changes – being delivered now. This specialty is being delivered now – it will however be redeveloped to cater for market requirements. Teaching resources are being gathered to facilitate full blended learning. Funds for development of this in early 2009 are being sought from the September Innovation Fund Grant. Gathering of teaching resources already started. Design of course outline will be ready to go to Academic Board before end of year. One further specialty is planned for development in 2009. (This is will facilitate the offering of different specialties and student choice year to year). Progress is continuing on development of teaching resources for the Reception services and Tourism Enterprises specialties. This is proving to be time-consuming for the selling component as resources are not obviously available in the travel and tourism areas and need to be hunted out.Blogging for both these specialties is proving to be a bonus for students as they are able to pick up activities and resources from the blog especially if they miss class. However the ongoing problems we have been encountering with internet access - internet provider problems, is proving to be annoying - however have conteracted this by having a backup plan. Again this is a problem often encountered in the workplace no matter what industry you are in. It also highlights our reliability on internet access. Try looking at one of our blogs reception services blog . Our blogging classes have temporarily been put on hold just until teaching has settled down. We will then go back to once weekly time slots. Teachers are however writing posts on the course blogs which is working really well. I have also started working on the paper to be presented at the 5th Pan Commonwealth Forum on Open Learning in London in July. Susan Ellis from EDC is helping with the process which is proving to be complex but really interesting - hope those at the conference think so to. This year has started as a busy one and looks as though it will continue that way. We will be delivering the first year of the second year of the programme - which is exciting. There are four new lecturers involved and I am sure the students will benefit from the greater input. Each our our six specialties on the programme will run with a blog - this is a way for us to keep students relevant with the latest happenings in tourism, communicate with students and link activities from the course blogs to wiki educator. Students will also be given the opportunity to post comments on the blog - we will be trialing this with second year students. Take a look at Rachel's blog . We have also been looking at bloglines. The best news however has been the acceptance of my proposal to present a paper to the Fifth Pan Commonwealth Forum on Open Learning in London, July 13-17. Working on getting the funds together for this??? The paper will be on "Open Education and Training in the Travel and Tourism Industry" have a look at the wiki if you want to read the full proposal. The travel and tourism team - Kevin, Lynn and I have been busy perfecting our blogging techniques this week - hopefully all knowledge gained will not be lost over the holiday period. Leigh has posted the outcome (and more) of our discussion/meeting earlier this week follow the link http://learnonline.wordpress.com/ .Thanks Leigh, the objectives are clear and I will be working throughout January bearing in mind you will be away for February. Susan (EDC) and I were discussing putting together a proposal for a research paper on blogging, wiki's and how we are resourcing them and what will be involved in continued technical and resourcing support once the initial development is completed in 2008. We can start gathering research material now especially since staff have started training on part of the technical requirements eg. blogs. Could even develop into a text wiki or book. This will probably be my last post until after Christmas. So Merry Christmas and Happy New Year. Thanks for all the work this year Leigh and I look forward to working with you, Sunshine, Susan and the team in 2008. Thought this photo was appropriate for some of our team who are presently undertaking blog training. Kevin, Lynn, Rachel and I are being lead down the fast flowing waters of blogdom to the treasure of understanding. understand the medium before using our course blogs in 2008. I am mightly impressed and hope this new found skill is not lost over the christmas break. Sadly we will be losing one of our team. We wish her all the best for her future. Thank you. What do you think of our Bed and Breakfast model? As part of an assessment project Ciploma in International Tourism students completed this year "The Bent Trees" model was a highlight. We shall be putting it on the Wiki under Tourism Enterprises (under the new Diploma in Applied Travel and Tourism) as this aspect of the project will form part of the new assessment along with the other tourism business areas: marketing, financial control, operations management information and systems and human resources. The Otago Polytechnic (New Zealand) Diploma of Applied Travel and Tourism development on wikieducator has been granted further funds and salaried support for work in 2008. The orgainsation funding is the second instalement for the project which began in 2007 and continued connfirmation of the commitment management have to progressing this innovative and unique product on wikieducator, according to Programme Manager Hillary Jenkins. Our first group of students have finished for the year and while a few are graduating a good portion are returning for the second year of the diploma in 2008. 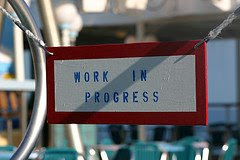 Staff will be spending the next few weeks revising the programme which run this year making improvements and updates.